The Gowanus Lounge: Ever Hear About Hog Island? Ever Hear About Hog Island? The weekly email update from the Empty Vessel Project, a World War II Navy rescue boat being painstakingly rehabilitated in the Gowanus Canal and used as a community performance and learning space, had some interesting hurricane-related historical info. The writer culled it from Brooklyn Public Library's online archive of the Brooklyn Eagle. Gowanus Lounge figures that it's in keeping with one of our unhealthy obsessions: the A Killer Hurricane hitting New York (as distinct from our ongoing concern about Bird Flu). On the night of August 23, 1893, a terrifying Category 2 hurricane did strike New York City. It hit land in the marsh that is JFK Airport today and began the erosion of the low-lying resort...All six front-page columns of the August 25, 1893, New York Times were dedicated to the “unexampled fury” of the “West Indian monster.” The storm sunk dozens of boats and killed scores of sailors. Everything below Canal Street was under water. In Central Park, hundreds of trees were uprooted...The brand-new Metropolitan Life building on Madison Avenue was severely damaged when a heavy-iron fence was torn away by the wind, plunging 10 stories and crashing through a stained-glass dome before landing on a mosaic "including quantities of costly Mexican onyx." A 30-foot storm surge swept across southern Brooklyn and Queens, destroying virtually every man-made structure in its path. In Brooklyn, at Wyckoff and Myrtle Avenues, "the water in the street was up to a man's waist," and residents used ladders to get in and out of their houses. Most of the boats moored at the Williamsburg Yacht Club were "sunk, driven ashore or demolished." The East River rose "until it swept over the sea wall in the Astoria district and submerged the Boulevard." At Coney Island, 30-foot waves swept 200 yards inland, destroying nearly every man-made structure in its path and wrecking the elevated railroad. Hog Island was seriously eroded by the West Indian Monster. Then, in 1896, a storm cut a new channel through it, and by later in the year it had been reduced to "small patches of sand covered with a few feet of water when the tide receded at daylight." By 1898, no more Hog Island. 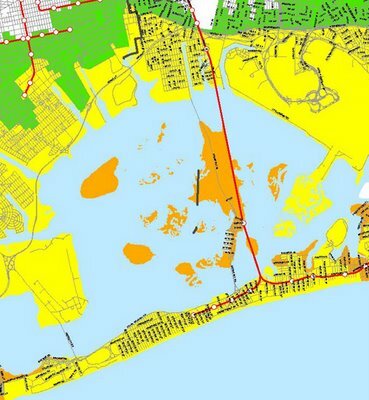 The colorful map above show that everything coastal would pretty much be toast in that part of Queens in a hurricane. (Brooklyn too.) Now, what was that we're supposed to be keeping ready? Oh, yeah, a Go Bag.